Anime Limited Licenses Ping Pong The Animation. First wave of Q4 releases confirmed. It’s MCM Comic Con in Manchester this weekend and we have slew of news to share with you as the weekend unfolds. Though the event begins tomorrow we wanted to start sharing our news with you today kicking things off with a glimpse at our release lineup for October & November that includes Sword Art Online II: Part 2 and a new license announcement! Let’s get started with the reveal of that new license announcement. First up is a series that we’ve had our eyes on for a quite a while. Ping Pong The Animation is from the creator of the Eisner Award-winning Tekkonkinkreet and directed by Masaaki Yuasa (The Tatami Galaxy and the Emmy award-winning “Food Chain” episode of Adventure Time) this series is sure to blow you away with it’s breathtaking animation and poignant storytelling all coming together to make it can’t miss addition to your collection. Childhood friends Makoto “Smile” Tsukimoto (ironically, he seldom smiles) and Yukata “Peco” Hoshino are capable and aspiring table tennis players of Katase High School. Coach Jō “Butterfly” Koizumi has high expectation to both of them, but when Peco gets decisively defeated by a Chinese student he becomes so devastated and stops practicing. Meanwhile, Koizumi discovers Smile’s potential and tries to motivate him to overcome his psychological obstacle. 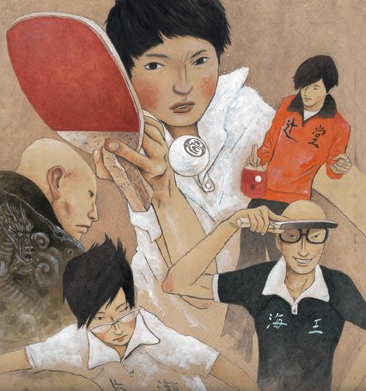 We’ll be releasing Ping Pong The Animation as a complete series set on both Blu-ray and DVD in October (date TBC). Our release will include both the English dub and the original Japanese audio with subtitles. You can watch a trailer for Ping Pong The Animation below. With the above information in mind we would also like to take a moment to tell you about some of our releases for fourth quarter of the year. Specifically during October and November. We know a lot of you have been wondering what we have planned so here is a brief glimpse into some what you can expect. You can expect these titles to be available to pre-order through online retailer sites within the next week or two. Be sure to keep an eye on us over this weekend as more of our fourth quarter release lineup will be revealed.